Also, it made me realize that some people just shouldn't drive when it's snowing because they forget how. That's all I'll say on that subject except for BE CAREFUL OUT THERE! With the white snow and cloudy skies, it seems like the perfect excuse to make a brilliantly colored and flavorful cocktail. This Spiced Rum & Cranberry Old Fashioned uses a little bit of the syrup from my homemade cranberry sauce. The spicy ginger, warm cloves, bright citrus and tangy cranberries are the perfect mate for spiced rum. You may be wondering what on EARTH rum is doing in an Old Fashioned. You're right- it isn't traditional. But the formula for an Old Fashioned is this: spirit + bitters + sugar + water. That's it. Makes you want to play around a little, doesn't it? When I make an Old Fashioned, I let the ice act as the water. It melts a little as you stir it with the spirit, bitters and sugar, which is really all you need. If you want more water, go ahead and add it. This is a great cocktail for Thanksgiving because it incorporates a lot of the flavors from other dishes; using aromatics like rosemary, cloves or cinnamon with your turkey? Serving my homemade cranberry sauce? Putting a cinnamon and brown sugar topping over your sweet potatoes? This cocktail is the perfect precursor to all of that and more. It's equally as delicious on any old day when you are feeling thankful for a quiet evening at home with family and friends. This cocktail recipe concludes my week of cranberries! Stay tuned next week for a fantastically easy apple dessert and a delicious leftover turkey recipe! 2 or 3 fresh (or frozen) cranberries for garnish. Combine the cranberry syrup, spiced rum, brown sugar and bitters in a cocktail shaker. Stir until the sugar has dissolved. Add ice and stir for about 30 seconds. Pour the cocktail through a strainer into a cocktail glass filled with ice. 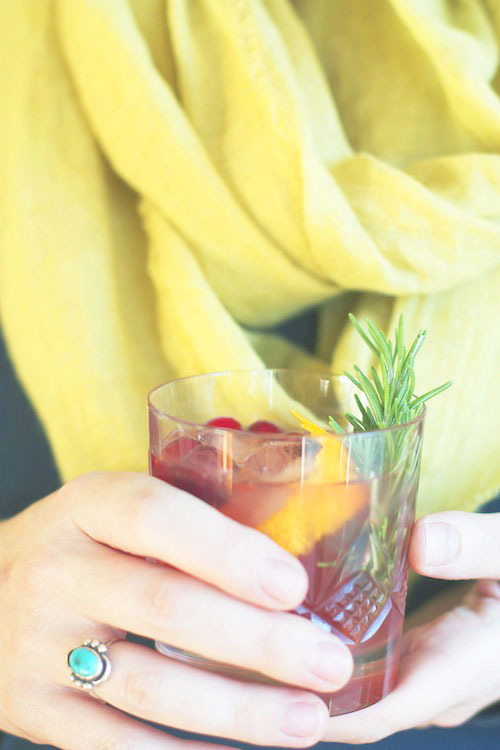 Serve garnished with the orange zest, cranberries and rosemary sprig.